The Campaign to Bring Mumia Home is thrilled to announce our new project titled, Inside the Activist Studio (IAS). Inside the Activist Studio is an interview style, web-based series, modeled after the popular T.V. show Inside the Actors Studio. Each episode will feature an interview with an activist about their political awakening and biography of activism. The series will be taped before a live studio audience. 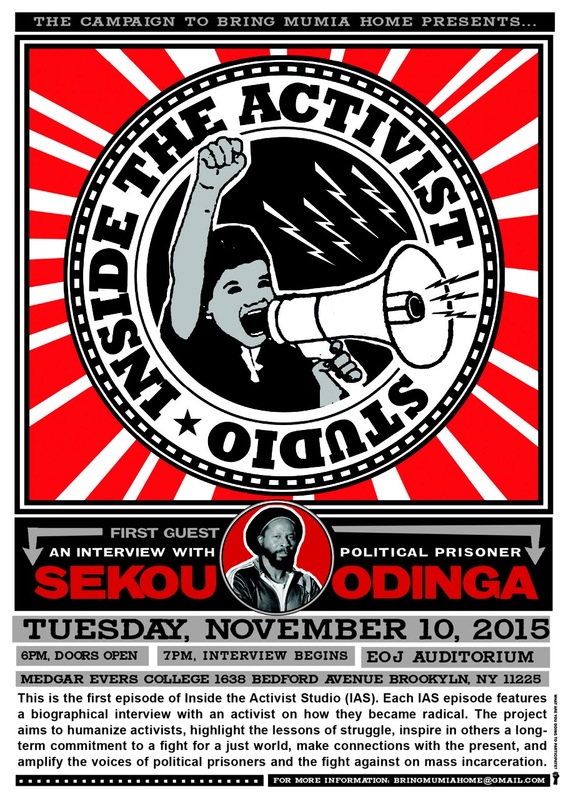 Our first episode will feature political prisoner, Sekou Odinga, on Nov. 10, 2015 at Medgar Evers College. We hope you will join us. Inside the Activist Studio aims to raise the profile of political prisoners and build the movement to end mass incarceration. It is rooted in the tradition of Mumia Abu-Jamal’s groundbreaking political journalism.